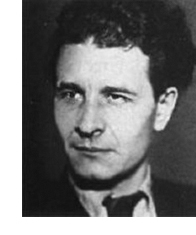 Yevgeny Ivanovich Zamyatin (1884-1937) wrote one of the most famous dystopian novels of the twentieth century: My (in Russian), translated as We in 1924. It was set in the 26th century AD, in a totalitarian state where citizens were called “numbers”. The narrator is D-503, who has a doomed love affair with a revolutionary woman, I-330. It was an inspiration for Orwell’s Nineteen Eighty-Four (1949). While in England in 1917 Zamyatin wrote a shorter piece which is a kind of trial run for We: Ostrovityane (Islanders) is a novella which satirises English philistinism and abandonment of individualism. For more, see Darko Suvin in the Encyclopedia of Science Fiction. Zamyatin (or Zamiatin, or Zamjatin) was born in Lebedian, the son of an Orthodox priest and schoolmaster. He went to school in Lebedian and then in Voronezh. He studied Naval Engineering at St Petersburg Polytechnic Institute from 1902 to 1908. His studies were interrupted in 1905 when he was imprisoned and exiled for his role in the abortive revolution of that year. He spent some time in Finland, but also continued to live surreptitiously in St Petersburg, continuing with his studies. He graduated in 1908, and began lecturing at the Polytechnic Institute himself. He was again imprisoned and exiled in 1911, but was released under an amnesty in 1913. He was in England for his “war experiences“, and returned to Russia on the eve of the October Revolution in 1917. He had published fiction before 1914, and after 1917 he continued writing fiction and non-fiction articles for various journals. He served on various literary organisations, becoming the leader of the All-Russian Writers’ Union, and edited Russian translations of works by Jack London, H.G. Wells and others for the World Literature Publishing House. Although he was in favour of the Revolution, the Bolsheviks were deeply suspicious of him: he was arrested in 1919 and 1922, and in 1926 a play of his was closed down by the authorities. My (We) was his only full-length novel Zamjatin wrote. He completed it in 1921, and a translation into English was published in 1924. Extracts from the original text were published in an Russian émigré journal in Prague in 1927, while in Russia My circulated only in manuscript. The authorities clearly knew about the book, however, which was rightly seen as highly critical of the Bolshevik regime. In the late 1920s Zamyatin had to give up his public roles, and his works were banned. He was allowed to go into exile in 1931, and in 1932 he and his wife settled in Paris. There he worked on a novel about Attila and the Roman Empire in the fifth century (in which he could reflect on the relationship between Russia and the West), but this remained unfinished. He died in Paris in 1937. We was not published in Russia until 1988; now he is regarded as one of the great Russian writers of the twentieth century. So far my information comes largely from an online article by Petri Liukkonen.